Image caption Drivers who may have been passing the scene at the time have been urged to come forward. 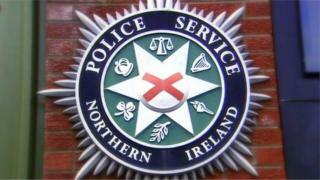 A cash-in-transit van has been robbed at gunpoint during an incident in County Londonderry on Saturday afternoon. Police have described the robbery as a "brazen and despicable act". It happened in the Greysteel area outside a shop and filling station on Clooney Road. Police received a report that two men, one armed with what was described as a handgun, made off with a cashbox containing money. The driver of the van was not injured during the incident. Detective Sergeant Wallace said the driver had been "left shaken by what must have been an absolutely frightening ordeal". "This was a brazen and despicable act that was carried out at a busy time when there would have been a number of customers in the forecourt of the premises," he said. SDLP councillor Orla Beattie said the delivery and collection of cash in the area was "an important part of everyday life" and called for those carrying out the task to be "protected and supported". "I have no doubt the sight of men with guns must have been a terrible experience for the personnel and I sincerely hope they can overcome this cowardly attack on their work," she said. Sinn Féin councillor Dermot Nicholl condemned the "reprehensible attack" and said it "must have been a terrifying ordeal for the driver of the van and others in the area at that time". Detective Sergeant Wallace said there had been a "steady flow of traffic through Greysteel" at the time of the robbery, and appealed to anyone in the area, or who saw two men matching the description of the suspects prior to the robbery to come forward. He also urged anyone who captured dash cam footage of the incident to contact police.